Testosterone promotes the beard growth and is an important component of beard growth injection. An adult requires some levels of testosterone, i.e., between 300 and 1000 ng/dl which needs to be maintained. If you are having hair loss issue or difficulty in beard growth, the physician will ask for the blood test to measure the testosterone levels, but if the levels are lower than the range, the doctor may suggest testosterone injection. These are used in testosterone replacement therapy. For men, testosterone injection works to boost testosterone production, while women are given testosterone injection to treat breast cancer that is malignant. It helps in beard growth by stimulating the hair growth. The doctor usually administers it in the gluteal muscles in the buttock. In some cases, the doctor allows self-administration to thigh muscles. How is a testosterone injection administered? Testosterone is injected in the muscles after every 2 to 4 weeks depending upon requirement because the overdose of testosterone is not good and may cause the symptoms mentioned above. After diagnosis depending upon testosterone levels, the doctor recommends the testosterone therapy, and it helps the boys having delayed puberty, etc. It is also effective for older aged people whose testosterone levels reduced. Are they effective for beard growth? Testosterone or beard injections are great for growing facial hair thick and men having high testosterone levels have thick and great beards. Nowadays beard growth is considered mandatory because according to studies men having a beard are considered cool, and women get attracted towards them more. Beards are considered a symbol of manhood, and boys who are having difficulty in beard growth are usually recommended to have testosterone injections that help them to grow a beard. Testosterone is a hormone and contains dihydro-testosterone (DHT), which is a steroid present in it, which accumulates in the head hair follicles and may cause baldness. Men who are old usually get bald because of this reason that DHT collects in the hair follicles, and they start losing head hair, but DHT has no effect of baldness on the body or facial hair. Every man is different and has different DHT levels in his testosterone that determines when men will go towards baldness. Some men have high DHT levels and get bald at an early age, but some have low DHT levels which prevent them from getting bald. Beard growth injections are effective for beard growth up to some extent but as the injection is muscular and may increase the DHT levels in the body which increases the baldness risk. Mostly DHT blockers are recommended to maintain the normal levels. The best thing is to have supplements which are natural and easy to use. Beard injections can be administered at thigh at home but that is not safe, but a supplement can be taken easily, and maximum absorption is possible due to supplement. Oils, creams, and lotions containing testosterone are available in the market that when applied to scalp or face stimulates the follicles and promotes beard growth. Although these supplements work great to produce thick and long beard, it’s not guaranteed that they will produce desirable effects because genetic also play an important role. If you have a genetic issue, your beard will not grow like others having low testosterone levels. In those cases, other methods can be used for beard growth. Our premium, all-natural supplement was created by experts using a unique blend of ingredients such as Biotin, Collagen, Horsetail Extract, and more. 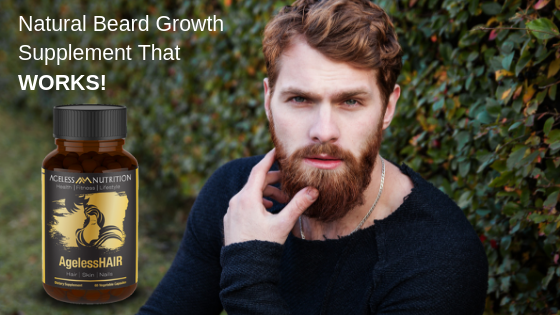 This unique formula has been proven to enhance hair quality and improve hair and beard growth. The perfect supplement for men and women who want to show off younger, fuller, shinier hair!